Beach: Just across street from bay beaches. 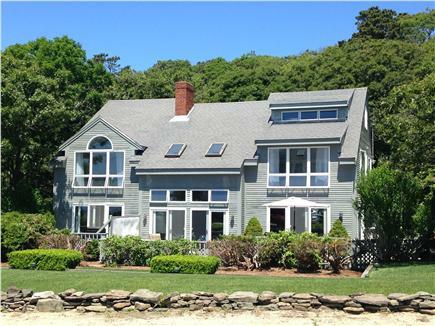 Being offered for weekly summer rentals for the 2017 summer season is one of Provincetown's finest residences. 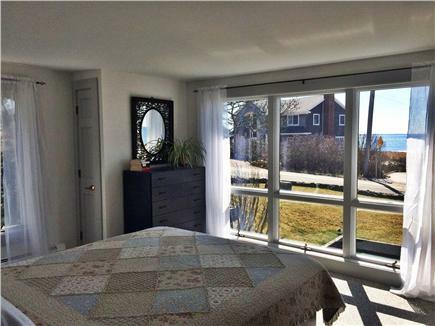 This is a fabulous, bright and sunny, contemporary home located in the east end of Provincetown. 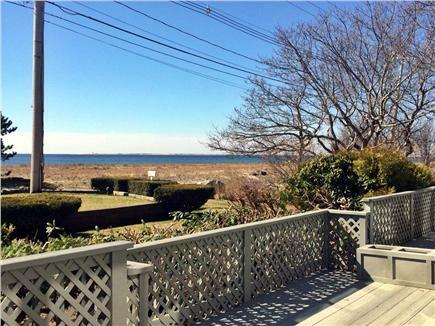 There are beautiful water views and deeded beach access just across the street. The house is architecturally stunning with an open, airy floor plan, magnificent slider set-ups as well as several large floor length window units. The front foyer entrance opens into the spacious sculptured cathedral ceiling living room with floor to ceiling, wood burning, used-brick fireplace. Double and triple banked sliders from the living room and kitchen lead to a sunny, southwest facing wrap around deck. 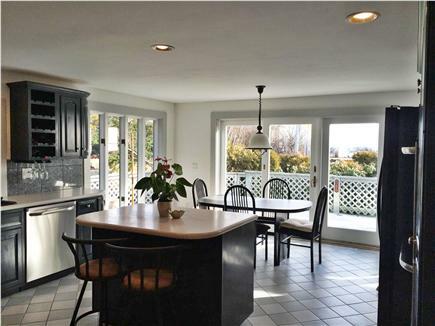 There is a large eat-in chefs kitchen with distressed black Scandia cabinets and island. There are stainless double wall ovens, dishwasher, fridge with water and ice maker, and a ceramic glass cook top. The kitchen is amply equipped with newer Cuisinart 11 piece cookware set, coffee maker, blender, toaster, as well as all small gadgets, and various serving pieces etc... 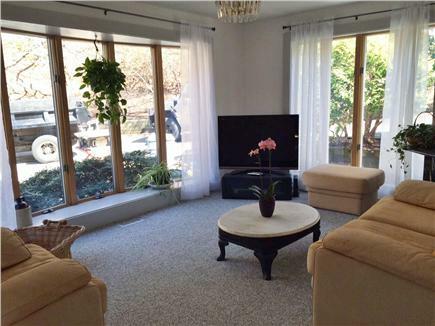 There is a cozy TV room off the kitchen and living room with a great 42'' HD flat screen television. Walk up to the second floor and across the open rail bridge overlooking the living room and foyer to the master bedroom with beautiful southwest facing water views, sculptured cathedral ceilings, closets galore, and en suite bath with whirlpool, shower, and marble wainscoting. 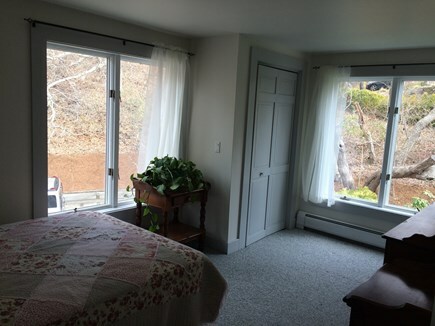 The second sun filled bedroom also has beautiful water views. The third bedroom is north facing, and there is a full bath with double vanity located between these two bedrooms as well as the laundry center. 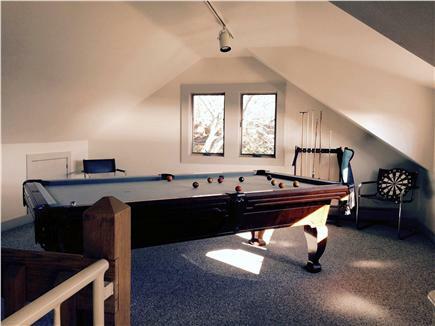 As an added bonus there is a spiral staircase leading to the third level which houses a Brunswick pool table and water views. Other amenities include cable TV, wireless Internet, and a gas BBQ grill. All linens and towels are included. As the owners, we take great pride in overseeing of the weekly change overs and guarantee that the home and surrounding landscape will be immaculate and pristine!! The yard is large with grass sod lawn, mature landscaping and parking. We have freshly painted the entire interior of the home and exterior front entrance and southwest facing deck. There are brand new mattresses last season, appliances, new living room furniture, new out door dining set with umbrella and new gas grill. Please inquire as to available payment options. Nearest beach: Just across street from bay beaches. Additional pricing info: The above pricing is for a max. occupancy of six people. We accept credit cards! !, State and local taxes of 14.45% will apply.